In 1860, essayist and poet Ralph Waldo Emerson wrote, “We learn geology the morning after the earthquake, on ghastly diagrams of cloven mountains, upheaved plains, and the dry bed of the sea.” Human nature remains the same now as then—we often learn our geologic lesson after an earthquake, rather than plan in advance. The seismically active central Wasatch Front of Utah, with a population of about 1.7 million centered upon Salt Lake City, has the potential to be shaken by a strong (magnitude 7) earthquake. However, the region has not experienced a strong earthquake in historical time. 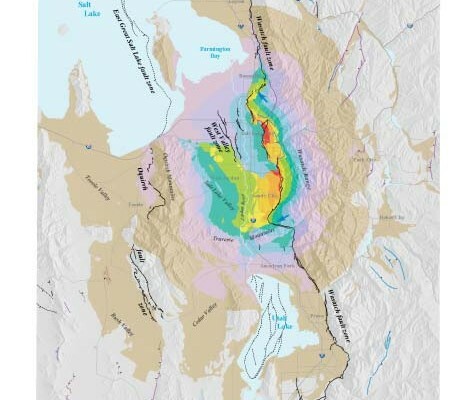 To help understand earthquake risks and estimate losses in the region, we mapped geologic hazards posed by a magnitude 7 earthquake along the Salt Lake City segment of the Wasatch fault zone, a major active zone of normal faulting. Federal, state, and private-industry partners cooperated in this study, partially funded by the U.S. Geological Survey’s National Earthquake Hazards Reduction Program and with additional support and technical assistance from the Utah Division of Emergency Services and Homeland Security, URS Corporation, and Pacific Engineering & Analysis. Our hazard maps will provide the geologic basis for a comprehensive loss estimate using HAZUS computer software, which was developed for the Federal Emergency Management Agency for use in estimating losses and planning for emergency preparedness, response, and recovery. The earthquake hazards we mapped include surface fault rupture, tectonic subsidence, earthquake ground shaking, liquefaction, and earthquake-induced landsliding. Most hazards were mapped by considering the thickness of unconsolidated deposits (“soil” to geologists and engineers), rock and soil properties, and the relationship of thickness and properties to effects observed in historical earthquakes worldwide. The Wasatch fault zone trends north-south through the Wasatch Front and is divided into 10 segments, including the Salt Lake City segment. Geologic evidence indicates that the Salt Lake City segment generates large earthquakes (approximately magnitude 7) on average every 1,350 years, the most recent having been about 1,300 years ago. Because a large earthquake on the Salt Lake City segment will affect the greatest number of people and probably produce the greatest losses along the central Wasatch Front, we selected a magnitude 7 event on this segment as the scenario earthquake. Movement along faults deep within the earth generates earthquakes. In Utah, if the earthquake is strong enough, commonly greater than magnitude 6.5, the fault movement will break to the ground surface. Along the Wasatch fault zone, this surface fault rupture will form a near-vertical scarp as one side of the fault is uplifted and the other side is downdropped. 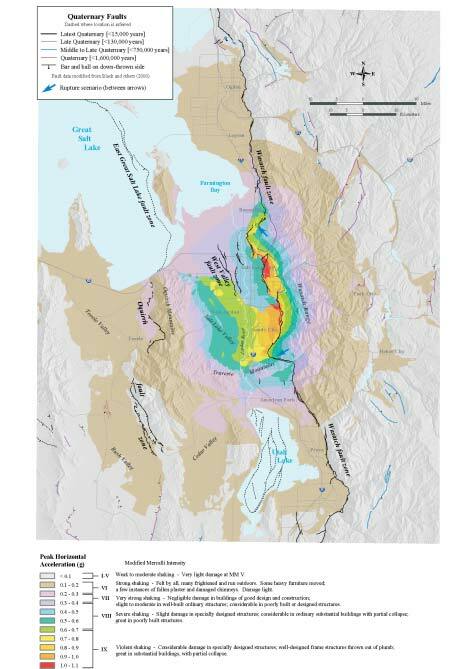 We estimate an average scarp height of 6.1 feet where faulting occurs along the East Bench of Salt Lake Valley. This amount of displacement is capable of causing irreparable damage to any structure built across the scarp. A zone of additional deformation will likely accompany the main scarp on its downthrown side. When earthquake faults break the ground surface in a geologic setting like the Wasatch Front, the adjacent valley floor may drop down and tilt towards the fault, creating a subsidence trough. The extent of tilting is controlled by the amount and length of surface fault displacement. When the Salt Lake Valley floor tilts during the scenario earthquake, the shoreline of Farmington Bay in Great Salt Lake will shift to the southeast. Developed areas near the lake shore and in the northern Jordan River flood plain may be flooded if the level of Great Salt Lake is high when shifted. Subsidence may also cause localized ponding of shallow ground water east of the Jordan River in Salt Lake Valley. Ground shaking is the most widespread hazard resulting from the scenario earthquake. Normally, a building need only withstand the vertical force of gravity (assigned an acceleration value of 1 g) to support its own weight. However, during an earthquake a building is also subjected to horizontal accelerations from ground shaking. These accelerations have the potential to cause damage to weak structures (buildings not specifically designed to resist earthquakes) if they are greater than 0.1 g, and damage potential increases with the strength of ground motions….. During our scenario earthquake, potentially damaging ground motions extend north to Ogden and south to Provo at distances of 30 to 40 miles from Salt Lake City. The strength of ground motions rapidly decreases with increasing distance from the fault on its upthrown side in the Wasatch Range, although potentially damaging ground motions may occur in the mountain valleys. Potentially damaging ground motions are amplified in certain deposits of sand and gravel, particularly those present on the east side of Salt Lake Valley. Liquefaction occurs when ground shaking is strong enough to cause shallow, water-saturated, cohesionless soils (commonly sand) to lose their strength and ability to support the weight of overlying soil and structures. Liquefaction is one of the major causes of earthquake damage. During our scenario earthquake, much of Salt Lake Valley and nearby areas has a potential for large lateral (possibly greater than 1 foot) and vertical (possibly greater than 8 inches) liquefaction-induced ground displacements. Research suggests that damage may be severe from ground displacements this large, and much of the damage may be irreparable. However, the extent of soils having the potential for large liquefactioninduced displacements is deceiving. Their widespread distribution is due to the high levels of ground shaking resulting from the scenario earthquake, which can cause large displacements even in soils that are not usually prone to liquefaction. Although possible, large displacements are unlikely in southern Salt Lake Valley, but are most likely in the densely populated northern part of the valley, the west Bountiful area, and the northern end of Utah Valley. 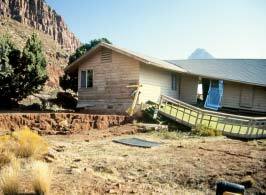 Another geologic hazard that may be caused by earthquake ground shaking is landsliding. Slopes considered unstable under normal conditions will be even less stable during moderate to strong earthquakes, and some slopes that are normally stable may also fail as a result of earthquake ground shaking, particularly if wet. Landslides can damage buildings, transportation routes, and utility lines by displacement of the ground, and cause flooding due to discharge of springs and damming of streams. During our scenario earthquake, landsliding will likely be most severe on mountain spurs of the Wasatch Range adjacent to Salt Lake Valley, threatening downslope development in areas such as the East Bench. However, prehistoric landslide deposits are relatively rare on these slopes, suggesting that landslides have not commonly occurred during previous large earthquakes in Salt Lake Valley. Landsliding may also occur along steep banks of the Jordan River in southern Salt Lake Valley and, to a lesser extent, in the Oquirrh Mountains to the west, the Traverse Range to the south, and the Wasatch Range interior to the east. Because landsliding is more common under wet conditions, the hazard will be greatest from a springtime earthquake during snowmelt. Our geologic-hazard maps, available publicly later this year, demonstrate the widespread effects in the central Wasatch Front of the scenario earthquake. However, we don’t have to wait until, as Emerson wrote, “after the earthquake” to learn our lesson. We hope that these maps provide a basis to better understand earthquake risks and encourage loss reduction in Utah before the next strong earthquake happens. Being prepared is a much better choice than waiting idly by for disaster to strike.